Certainly Kevin Coster would have been at Rheinback if it wasn’t for the Mohegan Sun 10th anniversary… I suppose he felt that Dancing with Wolves was a more grossing movie than Field of Dreams. Baseball maybe America’s past time but try a telling that to a bunch of passionate knitters. I went to Rheinback on Sunday… I missed out on the blogger meet up which I hear was a mob scene. I didn’t get to buy any Socks that Rock (nor stand on the 2 hour line that it caused) but I did get to see Cara, Ann and Vicki. Cara’s Seraphim was simply beeeautiful in person! And I got to see the Original Jaywalkers… boy they ROCK!! It’s so good to see she wears them with Pride. As would I! I passed Margene but didn’t get to say hi (sorry Margene, HI!!!) And I passed the Harlot, who was just carrying on like everyone else. And now I keep reading updates from all these other bloggers that were there and I just didn’t know it. 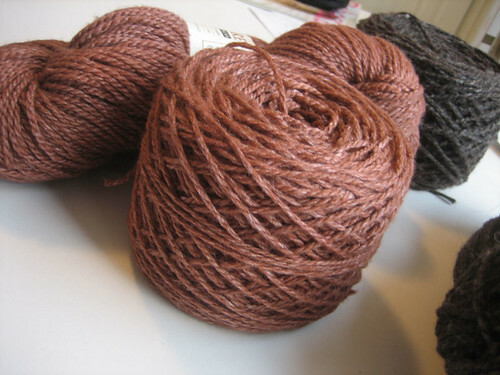 I wanted to concentrate on the fiber for my first time and that’s just what I did. So many things to see! Alpacas, sheep, lamas… roving, wheels, spindles… oh my. 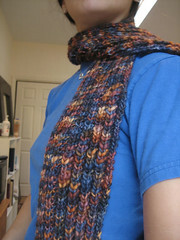 I also finished Julie’s Scarf this weekend. A whole two weeks early! I plan on giving it to her before her race as an incentive. I love love love the color. It reminds me of the changing leaves in October. It’s Manos color 111 and I used Size 10.5 for the Mistake Rib. It knitted up so quickly… ahh a FO! Now to wait a WHOLE other year for this wonderful experience…. If you knit it, Rheinback will come. Hi!! Sorry we passed in the night!